Tooth - Denticle in a male B6C3F1 mouse from a chronic study. 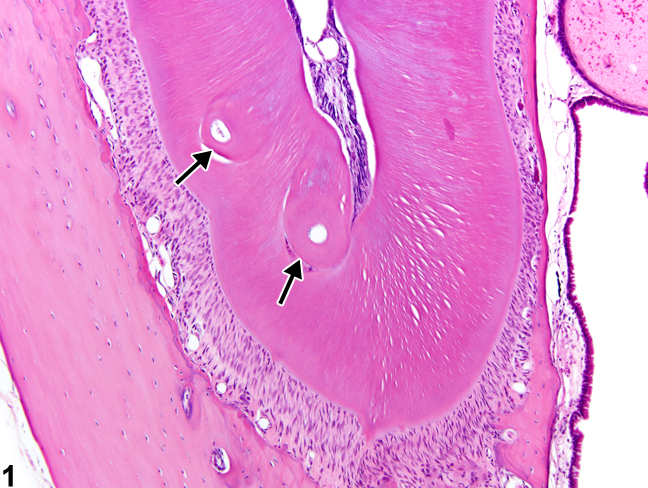 There are 2 denticles within the dentin layer (arrows). Tooth - Denticle in a male B6C3F1 mouse from a chronic study. 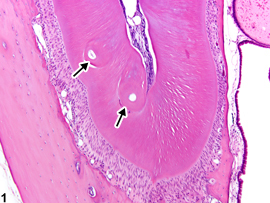 There are 2 denticles within the tooth pulp (arrows). Tooth - Denticle in a male B6C3F1 mouse from a chronic study. 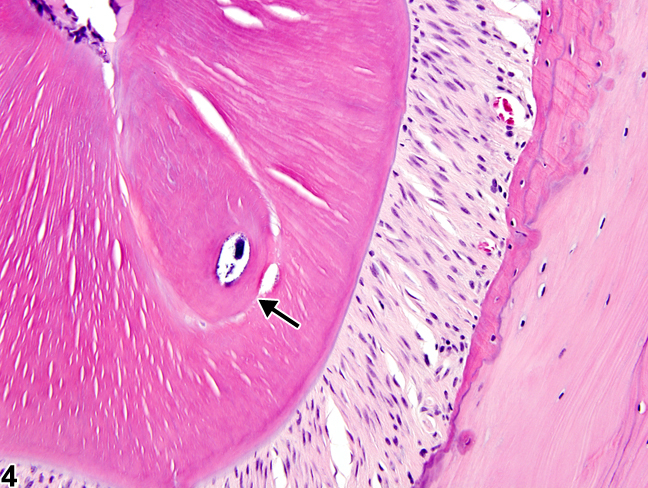 There are multiple denticles within the tooth pulp (arrows). Tooth - Denticle in a male B6C3F1 mouse from a chronic study. 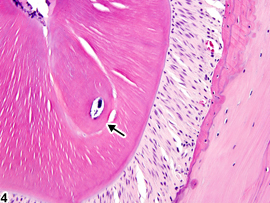 There is a denticle within the dentin layer (arrow). 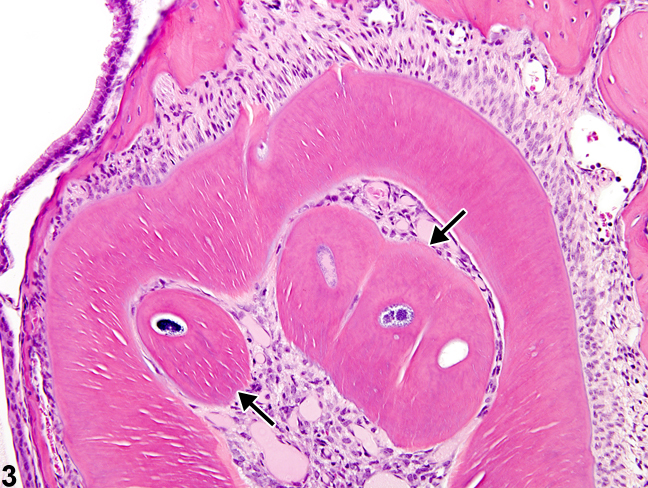 Single or multiple denticles ( Figure 1 , Figure 2 , Figure 3 , and Figure 4 ) are often seen in the maxillary incisors of control and treated mice. 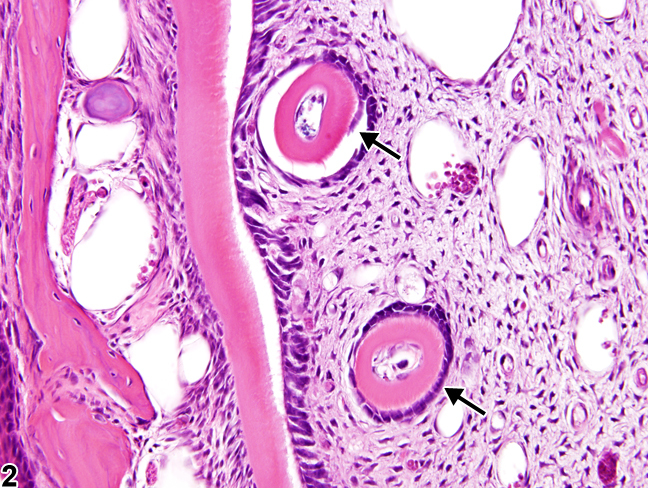 Histologically, denticles are round to ovoid in shape with a central cavity surrounded by tubular dentin. 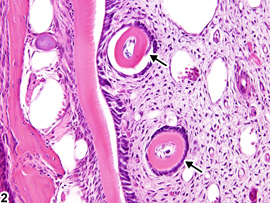 Immature denticles can contain epithelial cells within the central cavity, whereas mature denticles either are devoid of cells or contain cell fragments. Denticles originate in the tooth pulp but can become partly or entirely incorporated into the dentin layer. 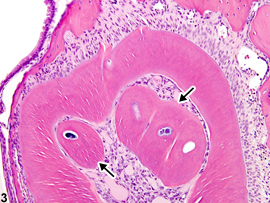 Denticles originate from small budlike projections emanating from the epithelial sheath, immediately adjacent to the pulp chamber. A layer of columnar odontoblasts surrounds the outer surface of intrapulpal denticles, although odontoblasts are not usually appreciated in denticles found within the tooth dentin or in closely apposed denticles. Intrapulpal denticle formation may contribute to the development of dental dysplasia in mice by interfering with normal tooth development and predisposing affected teeth to malformation and biomechanical failure and fracture. Since they are common background findings, denticles need not be diagnosed unless their occurrence is clearly treatment related. If they are diagnosed, they should be graded. Long PH, Herbert RA. 2002. Epithelial-induced intrapulpal denticles in B6C3F1 mice. Toxicol Pathol 30:744-748.